Want to get to know one of the top-rated branded pans out there? Gotham Steel Pans are definitely one of them! Pans are the most known to be a chef’s best friend. After all, what is cooking without them? However, there are varieties of pans available in the market and sometimes, because of that, we don’t know which one to choose! Specs range from different sizes, material, and even capabilities. This definitely makes the search a lot harder or complicated. Or as I thought? On top of that high-quality brands have flooded the industry to compete. 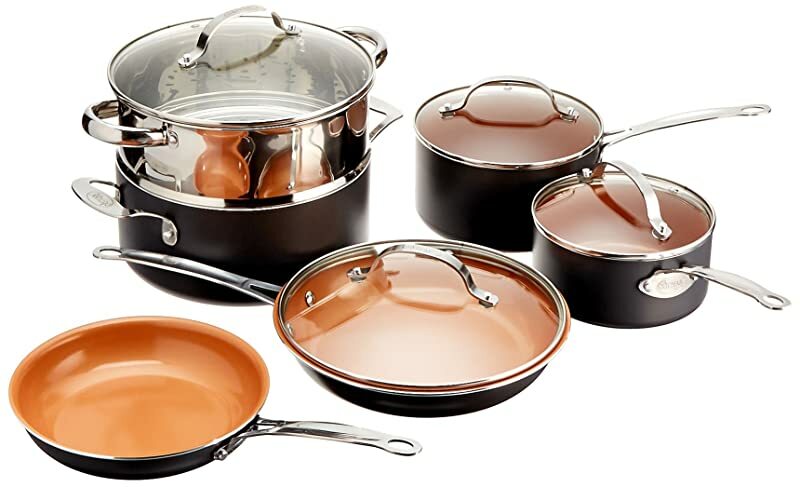 To mention are the Red Copper Pan brand, Copper Chef Pan and, of course, the Gotham Steel Pans! 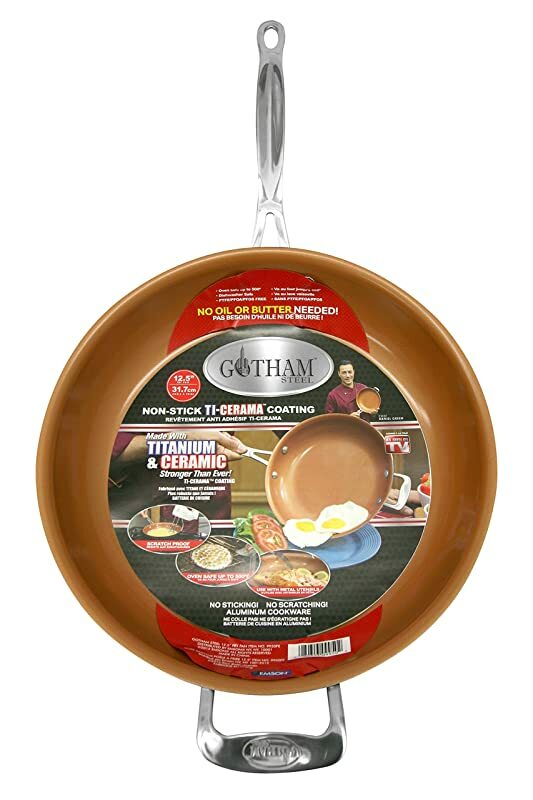 This is your chance to get to know the products through our Gotham Steel Pan Reviews! Let’s start! Are Gotham Steel Pans safe to use? Are their Non-Stick Coating Durable or Long-lasting? Gotham Steel Pans have been out and about for quite some time now and we have heard from a lot of people how it is considered as the new era of cooking. Let’s see what that is all about! So far, this brand has won the title as the “Newest Technology in Non-Stick Cookware”. I wonder why? 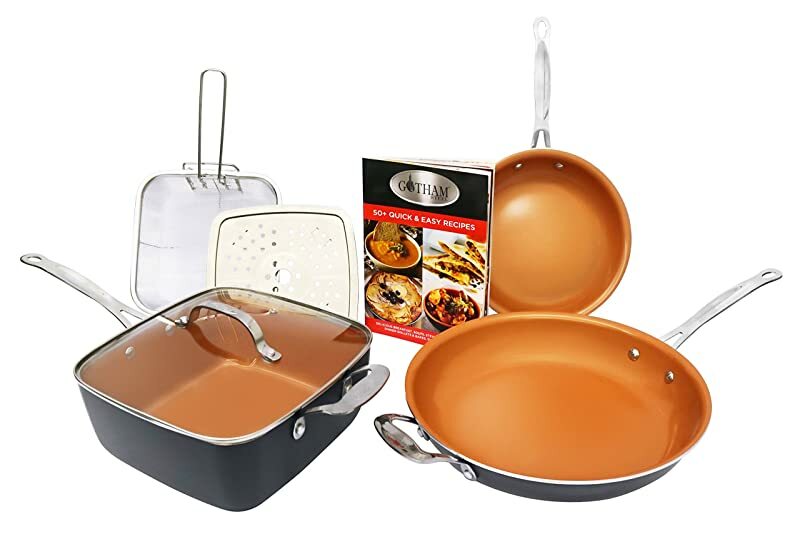 As claimed by the endorser, Chef Daniel Green, he says that these pans are non-stick. This is the ability to have anything on the pan slide off easily without it having to be stuck on it. Amazing, right? You don’t even need to put butter and oil anymore too! Having food stuck on your pan, is one of the most frustrating moments in our lives when it comes to cooking. All that scraping and tough work! 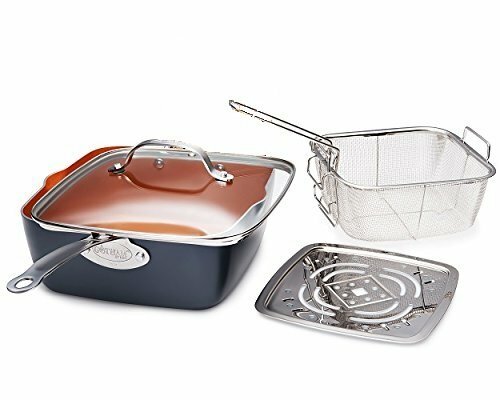 It has also been claimed that these pans are pretty much scratch proof due to its material build. This is great, knowing we can’t worry about that one anymore. iI’s guaranteed to be free from PTFE, PFOA, and PFOS, dishwasher safe and easy, and oven safe up to 500 degrees too! I’m glad you asked! And the answer is… yes! Gotham Steel Pans are very safe. In order to know whether the pan is safe, you should know the type of material it’s made out of together with the coating. The Gotham Steel Pans are known to be made out of completely safe materials that do not consist of any hazardous chemicals, harmful and toxic components. It’s made to be free from PFOA and PFOS. And for a bonus, even when you heat it to its maximum temperature (500 degrees), this does not affect, increase the possibility or release any toxic components into the air or into your food. Knowing the pan’s sturdy build and material, it definitely won’t increase the chances of grey marks or blacks on your food as it is somewhat scratchproof. Good thing that it’s dishwasher safe too. First thing’s first, we need to make sure the coating actually lasts. Some things are meant to last only if taken care well enough. In reality, nothing is ever indestructible or long-lasting. It really is a matter of how you take care of it. Even the strongest material has its own breaking point. So if you want your non-stick coating to still go on, you have to start practicing some care methods for it by adding oil to it once in a while or so. Every now and then, people are wondering about what makes a non-stick the way it is. Making a non-stick surface is basically a fusion or the cause of compatible chemicals that make it so. To make one a non-stick cookware, it has to be made out of a thin Teflon coating on your pan’s cooking surface. Another name for it is polytetrafluoroethylene. For short, it is called PTFE. Now, because of this, it has triggered quite a lot of potential health concerns which later then was replaced with another kind of material to make it non-stick. This material is another from the fluoropolymer kind. The Gotham Steel Pan is however claimed to be a hundred percent free from any PFOA and PFOS. Whatever material Gotham Steel Pans are using, they still manage to perform the incredibility of a non-stick cooking surface where you get that satisfying moment when your food does not stick at all and just slides softly down the plate! Here is a video of one of the Gotham Steel Pan-users, Josh Capon, a celebrity chef and see what they think of it, how they use it, its capabilities in the kitchen and their full review of the product itself! Let’s watch! People who bought this also mentioned that its non-stick coating may wear off if you do not take care of it well. 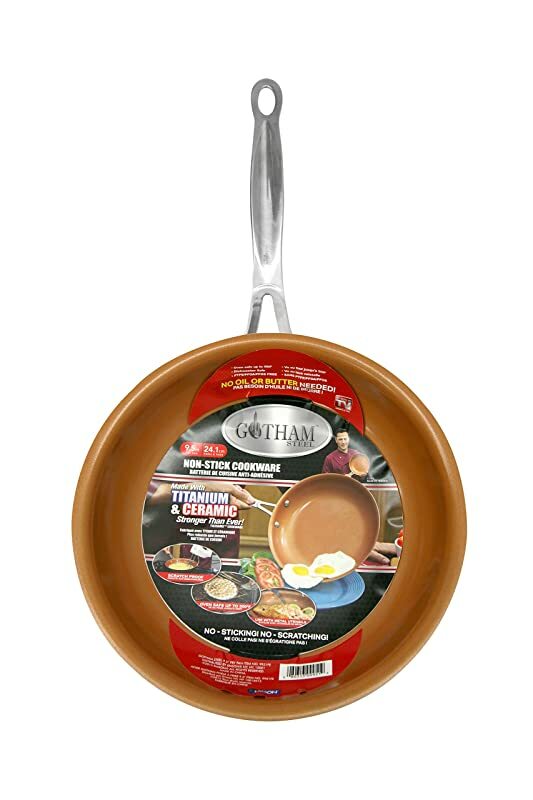 You are able to grill, fry and even boil certain recipes in this one Gotham Steel Pan! Alright, folks! Allow me to summarize what I think about the Gotham Steel Pans. For me, I think they are really good pans. However, I dislike the fact that not all its products can be trusted due to some reports stated in Amazon by reviewers all over the world. Some of its products may appear to you as a fake yet looks completely like the actual product itself. I suggest buying them from the original suppliers to guarantee your product’s safety and your money well spent. So far, the product does what it says it would. Quite handy, lighter than expected, cooks just about almost any recipe and is durable enough to stay longer throughout the years. However, its special features do intend to fade as time passes. But hey, this is normal. It happens to even the most expensive pans out there. Not a lot of it stays. It’s just reality. If you really want it to last longer, again, you have to practice a few care tips so that your pans won’t eventually degrade its quality. To do this, avoid doing much harm to it and of course, harsh chemicals and cleaning tools. Well, there you have it, guys! I hope to hear from you as well to what you think about the Gotham Steel Pans. If you liked this article, be sure to share it and like! Thank you.